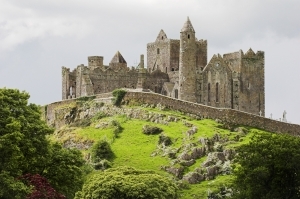 The Rock of Cashel, one of the most spectacular tourist attractions in Ireland, also called St. Patrick's Rock, is located in County Tipperary nearby Cashel, a small town surrounded by rolling green pastureland in the Golden Vale. The mysterious and mystic appearance of this solitary rock is given by the semi-destroyed walls of castle facilities and a historic cathedral that once played an important role in Irish medieval history. This rock is a place of worship for many generations of the Irish because, according to legends, St. Patrick, the patron of Ireland, lived and preached there. 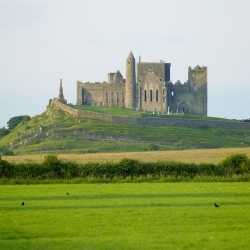 Today the Rock of Cashel enjoys great popularity among tourists as they are attracted by the ancient history of this place and various legends related to it. 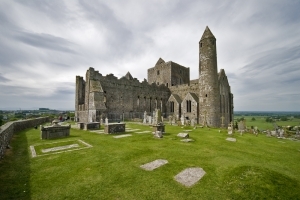 The contemporary complex of the Rock of Cashel comprises of several buildings and an old Irish cemetery where you can see various types of Celtic crosses. 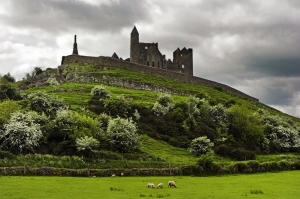 The medieval castle, the oldest building on the Rock of Cashel, has survived until today but it is in poor condition after losing part of its walls and storeys over centuries. The round tower, once served as a treasury and a watch tower, is slightly younger than the castle itself. It was built in 1100 using the «dry stone» method without any mortar – its stones are stable because they interlock with each other and compression forces are correctly laid out. In the 15th century the entrance to the Rock of Cashel ran through the Hall of the Vicars Choral where an archaeological museum is housed today. It presents the items found during excavation work carried out on the castle premises. There, you can admire the tomb of Miler Magrath, who lived in the 17th century and was infamous for being an archbishop of the Protestant and Catholic Church at the same time. In the Cathedral that was severely damaged during the fire of 1647 you can also see several historic tombs decorated with artistic carvings. 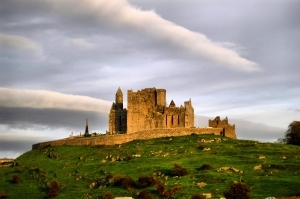 Another significant tourist attraction of the Rock of Cashel is Cormaca Chapel. In its appearance you can easily notice elements that are foreign to Irish architecture. It results from the fact that not only Irish masters took part in the construction of the chapel. For example, in order to build two low towers in front of the entrance, local bricklayers were sent for at the request of an abbot of Regensburg. Two carved tympana are of great value for the chapel, they were placed over its entrance and decorated with a scene presenting a fight between a centaur and a lion. 16 March -15 June – from 09:30 a.m. to 5:30 p.m.
16 June -15 September – from 09:00 a.m. to 7:00 p.m.
16 September -15 October – from 09:00 a.m. to 5:30 p.m.
16 October -15 March – from 09:00 a.m. to 4:30 p.m.